Now that Bear has a brother it made me think about how I am going to fit them both into our small box room. I will need something that they will love and is practical too. At the moment they will be fine in their cots but as they grow they will need proper beds and our room is too small for that. I know I am not alone, how do you fit a bed, a desk and a chest of drawers into a small bedroom? What about sleepovers? Where do you put up a friend? 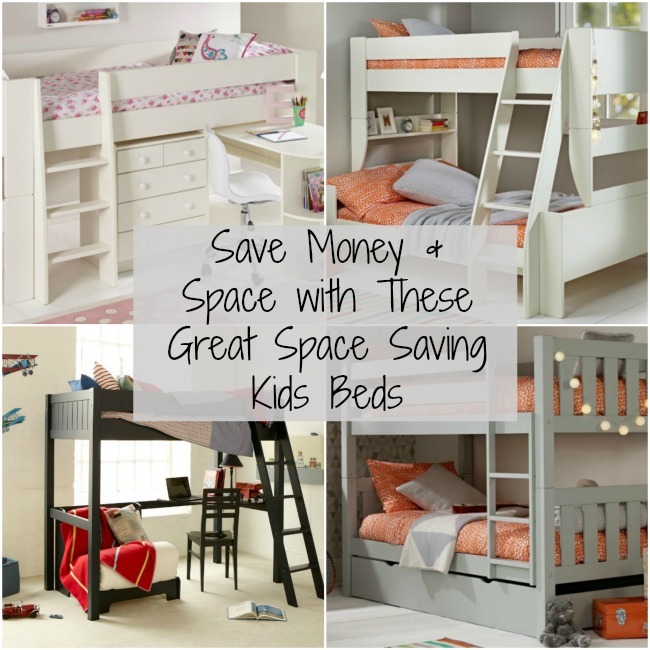 Room To Grow specialises in children's space saving beds. Here are five of my favourites. 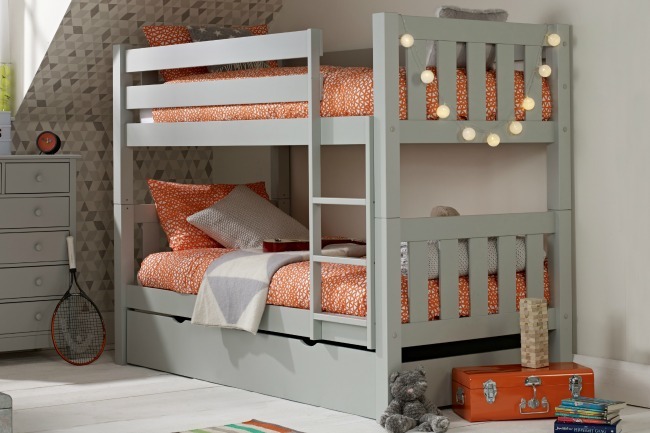 The classic solution is a bunk bed, gone are the days of garish orange pine now there are really stylish beds in modern finishes. 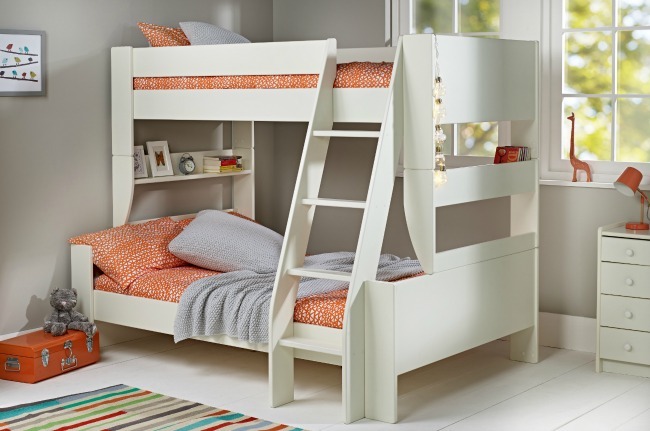 The Jubilee bunk bed comes in soft grey or ivory white. There is plenty of room underneath for storage, a great place to store toys. 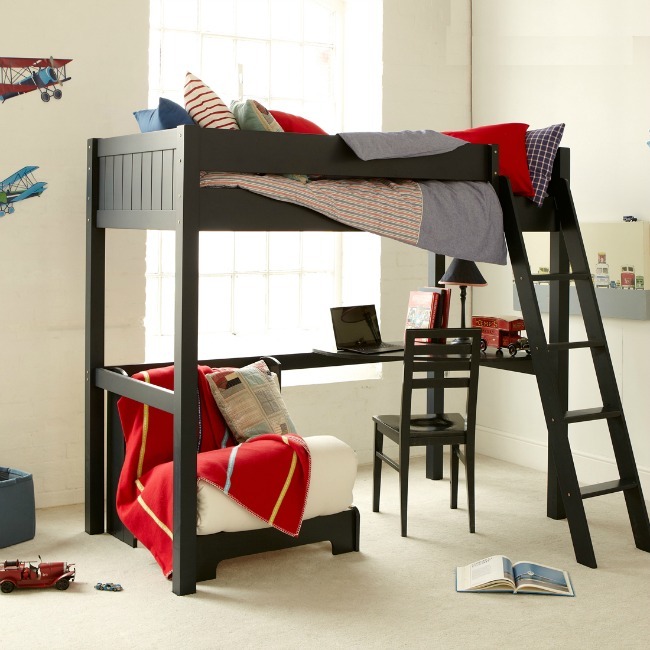 If you want one bed but need to fit a desk or other furniture in a small space then a high sleeper is ideal. This has room for a desk, a chair and a chest of drawers. I really love this idea, great if your little one doesn't like the height of the high sleeper and still room for a pull out desk and chest of drawers. I mentioned sleep overs and the next two beds are perfect for that. My first choice is a high bed with a futon and desk underneath. The futon can be used as seating and when a friend sleeps over it can easily be pulled out as a full size single bed. This bed is so clever, it can be used as a traditional bunk bed but when a friend sleeps over there is room on the small double for them. This would also be perfect if three children needed to share a room and only takes up a little more space than a single bed. All the beds in the range can be split to make traditional beds or with a kit be transformed into mid sleepers or high sleepers. These really will grow with your child and they look good too. At the time of writing there is a summer sale on, so not only can you save space but you can save money too. My little one has a bed very simular to the Solitaire White Mid Sleeper, he actually has a huge room but he has no storage, so we got it for that. love it has a desk. trouble is sometimes the price!!!! We got our almost new off a selling page for half the price! I LOVE THESE! I wanted a bunk bed my whole childhood but, as an only child, it never made sense to have one. Now I'm seriously considering one for my kids. My two are a bit too little for bunk beds but I'm sure they would absolutely love them when they are bit older. I used to have a cabin bed when I was younger and I absolutely loved it! well as with the layout on your blog.Is this a paid theme or ddid you modify it yourself? writing, it is rare too see a nice blog like this one nowadays.